A lot of things go into the success of a superhero. You've got to have powers, first off, or a wickedly difficult training regimen if you don't. You need a gimmick. You need a mission. You probably need a lair, fortress, or cave of some sort to call your own. And you need supporters. They can be butlers, like Alfred Pennyworth; colleagues, like Jimmy Olsen; or perky sorority girls-turned-secret-agents like Etta Candy. But they need to be there as right-hand men and women, juggling the details of anything from secret identities to cape-cleaning. 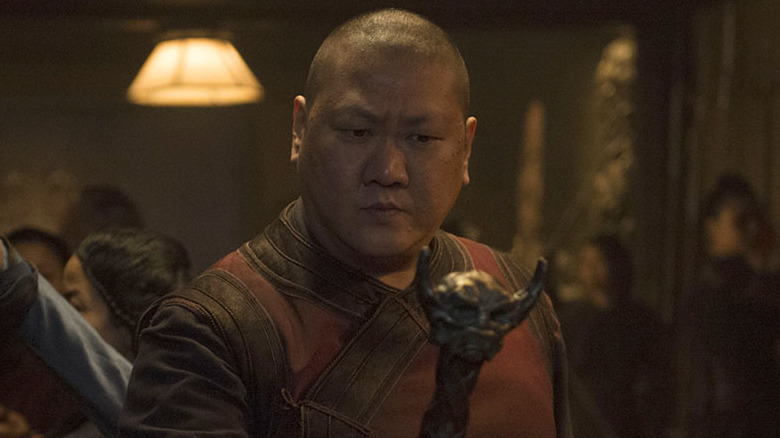 Doctor Strange has Wong (portrayed by Benedict Wong in the MCU), a diligent monk, warrior, chef, and adventurer. But there's a lot more to Wong than meets the eye — even the third one. He's been a blood-sucking fiend of the night, an impoverished orphan, and a lover who's been married, bereaved, and outright betrayed. Join us as we plumb the depths of the man behind the Doctor. 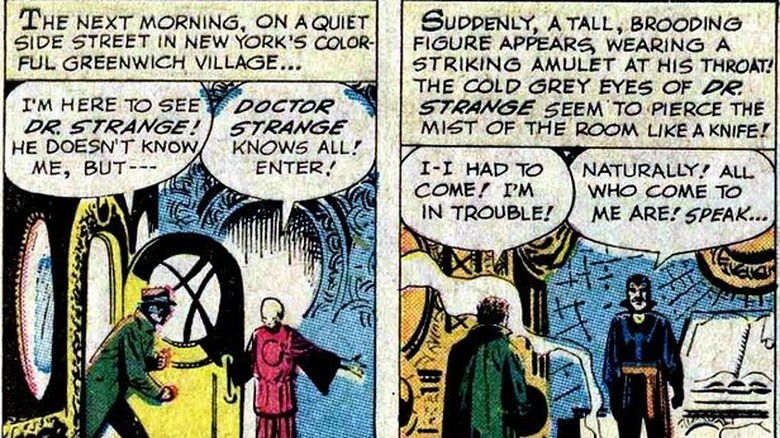 Wong was introduced alongside Doctor Strange in 1963's Strange Tales #110. The duo is strikingly creepy in their first outing — not evil, exactly, but menacing to behold and always draped in shadow. Strange is explicitly aligned with "black magic" and his Greenwich Village lair — then, of course, the stomping ground of outsiders, weirdos, and deviants — is all dark draperies and murky candlelight. Wong first appears when he opens the front door to a young man in search of Strange's brand of help. "Doctor Strange knows all!" he says, dressed in mysterious fuchsia garments. "Enter!" Wong wasn't a character early on so much as a piece of set dressing. He guided people to Strange's office, he wore whatever the artists thought looked "foreign" enough, and he served as a visual reminder of Strange's ties to the mysterious knowledge of Asia (which, as was unfortunately common at the time, amounted to whatever mumbo-jumbo the writers thought sounded convincing). It wasn't until Strange Tales #119, in fact, that he even gained a name, for a story in which Strange gives him the evening off. Ultimately, that would end up indicative of Wong's place in the Marvel Universe for quite some time: interesting, but ancillary. Things would change as the decades wound on, however, and readers demanded better representation and more complex stories. Wong has wandered far and near over his many years as Strange's assistant, but his origins are interesting unto themselves. The descendent of an ancient family, Wong's ancestors have served the masters of the mystic arts for untold generations — the eldest sons always devoted from an early age to the Ancient One in particular. Wong, being the eldest son of an eldest son, was barely toddling when he was presented to the Ancient One, and was swiftly sent to ensconce himself in studies of the arcane. Fairly standard stuff, as far as fantasy goes. Here's where it gets weird: Wong is particularly tied to Kan, his ancestor who lived one thousand years ago. 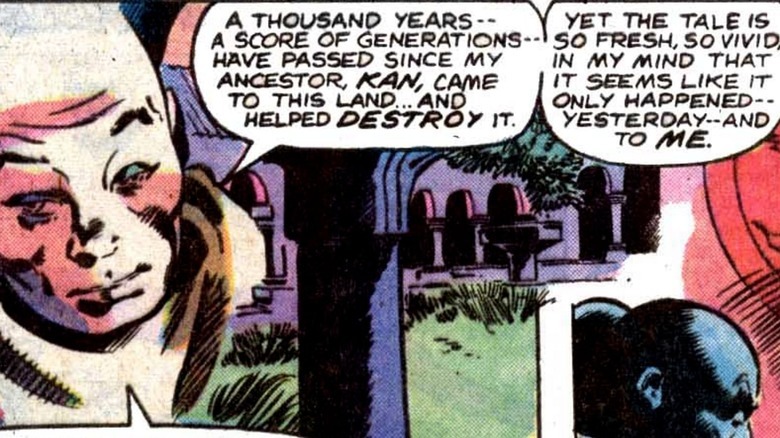 In the 1980s, Chris Claremont revealed that Kan, a student of magic and a brilliant warrior, was the first to dedicate himself to the Ancient One. He also happened to be absolutely identical to Wong himself. Given that Wong serves Strange and not the Ancient One, he is the first to break this tradition. Since the Ancient One commanded this, it's not exactly a transgression, but it does highlight Wong's significance. He wears a face that's been worn before and he's the first person in his family to break course in centuries. Though Wong might come from a long line of warrior-monks singularly devoted to their duty, he's made time for the ladies over the years. Chief among them is Imei Chang, his betrothed. Years passed from the time they were first engaged, during which they knew they were promised to each other but were too young to wed — years in which Wong went on many life-changing adventures and met many fascinating women. Sara Wolfe, Strange's secretary, was a particular temptation: an attraction grows between her and Wong that he puts a reluctant stop to, for Imei's sake. That's not to say his love for Imei is false, as they did in fact go on to marry and have a very happy life together until, in true comic book fashion, Imei was murdered by the sinister Sister Nils. Rather, Wong is a man about town — "town" here meaning "the entire cosmos and parts unknown" — and he's got a certain je ne sais quoi the ladies of every dimension simply can't deny. Comics are weird. Their weirdness used to be confined to the page, but nowadays kids know who Rocket Raccoon is and they're all making jokes about flerkens. It turns out, in fact, that weirdness is profitable. DC is giving Harley Quinn — who, let us remind you, is a psychologist who wears clown makeup and hits people with sparkly baseball bats — her own movie. There's going to be a show about the love between a grumpy witch and a British robot called WandaVision. The cinema's most fearsome bad guy looks like a California Raisin. We've pierced the veil of comic weirdness and the possibilities are endless. 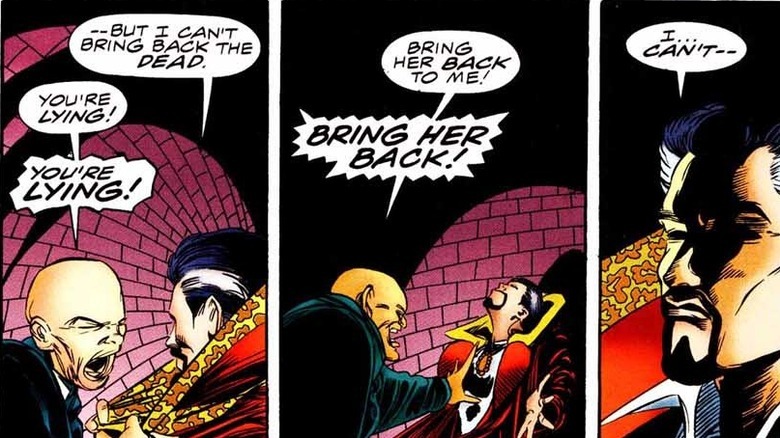 Here's one we hope to see imported to the MCU: Wong was a vampire once. Not an energy vampire, not a cool, leather-jacket-wearing "modern" vampire, but a blood-sucking, creature-of-the-night vampire, within the pages of the 1970s Tomb of Dracula comic and everything. He was, of course, promptly turned back by Strange. But for a moment, consider the possibilities. 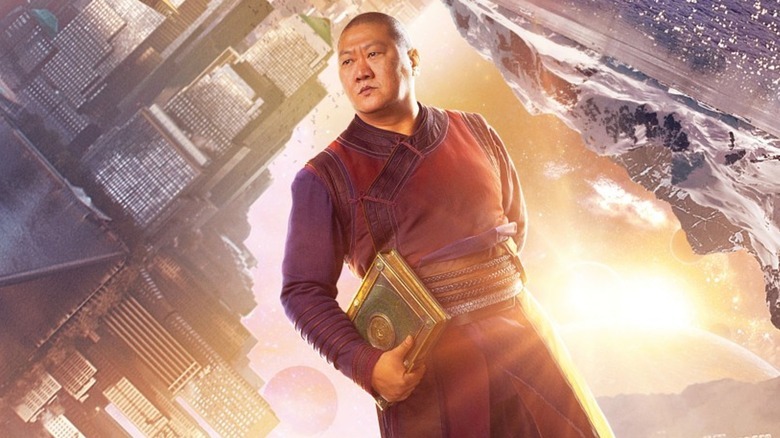 Wouldn't Benedict Wong look great in a high-collared cape? Basic superhero problem number one is protecting those you love. Many try to go without attachments entirely — see Batman, the lone crusader of the night. Some, like Spider-Man, try to keep those in the know down to a tight two or three of their most essential friends and family. Doctor Strange is one of these types, with a love interest here and there and, of course, Wong. Of everyone he's sided with, loved, or ended up cosmically soul-bonded to, Wong's been around the longest. Naturally, this means that Wong has been the one most often kidnapped. And boy oh boy, has Wong gotten kidnapped a lot. There's the time in the 1970s when the Shadowqueen captured him and put him in her dungeon. There's the time in the '80s when Urthona, an alien baddie, abducted Wong along with Strange's entire house. There are dozens of other times a dastardly type has merely restrained him briefly, or taken him to a location that isn't too far away, by cosmic standards. The bottom line is, he gets taken captive a lot. But in the modern day, he tends to fight back more. Gone is the Wong who must be held in mystical stasis for his own protection, as Strange so often did back in the Silver and Bronze Age stories they starred in. Here to stay is the Wong who fights back. Wong is allied with Doctor Strange more firmly than most who hold his manner of sidekick/assistant/attache-esque position. He is bound to Strange by family tradition, mystical ties, ancient custom, and at the end of the day, simple friendship. They have traveled through realms unseen and times untold together, sailed the cosmic seas and seen the bizarre beasts that live beneath its waves. Once you bend reality with someone, it's hard to say goodbye. 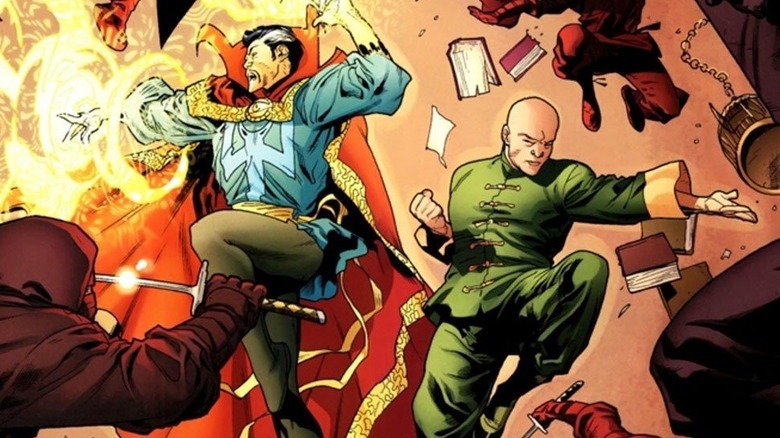 Generally speaking, throughout the character's history, where goes Doctor Strange goes Wong. But they haven't always gotten along like Greenwich Village and Sanctum Santorums. More than once, Strange and Wong have fallen out — one time in particular stands out as the nearest they ever came to ending their partnership. Doctor Strange: Sorcerer Supreme told a story in the mid-1990s in which a demon named Xaos impersonated Imei and turned Wong against his friend on behalf of the evil Salome. Though trickery was involved, Salome and Xaos were able to pull this off due to a very real tension between the two over Strange's failure to protect Imei, who, it turns out, was dead. Though the two ended up reconciling, it was a moment of truly broken trust between the two that took some time to repair — but ultimately made their relationship stronger. Wong has been around long enough to have faced a pantheon of foes. Cosmic abominations? Check. Murderous sorceresses with demons at their beck and call? Been there, done that. Magical forces too complex and corrupt to have anything so pedestrian as a single name? Roger. 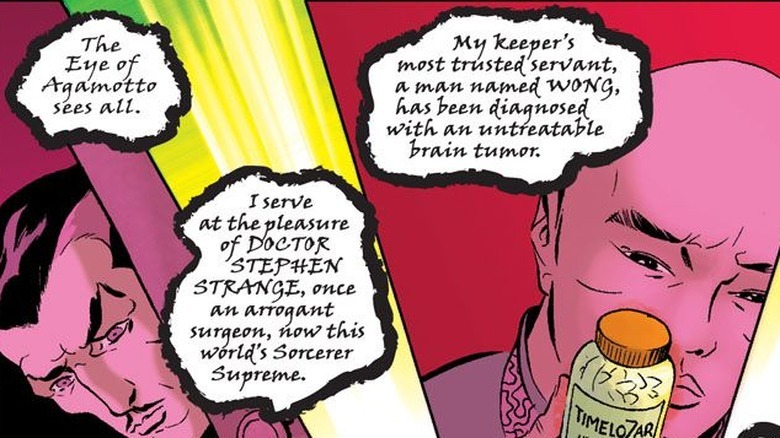 But in the 2007 miniseries Doctor Strange: The Oath, Wong faced down a truly implacable villain: cancer. At first, he tried to hide it until he'd found a replacement, but Strange happened upon a prescription targeting brain tumors while looking for a misplaced artifact. Heartbroken at the prospect of losing his oldest and most trusted friend, Strange embarks on a desperate, frantic quest to save him — and, of course, with the help of Night Nurse, succeeds. 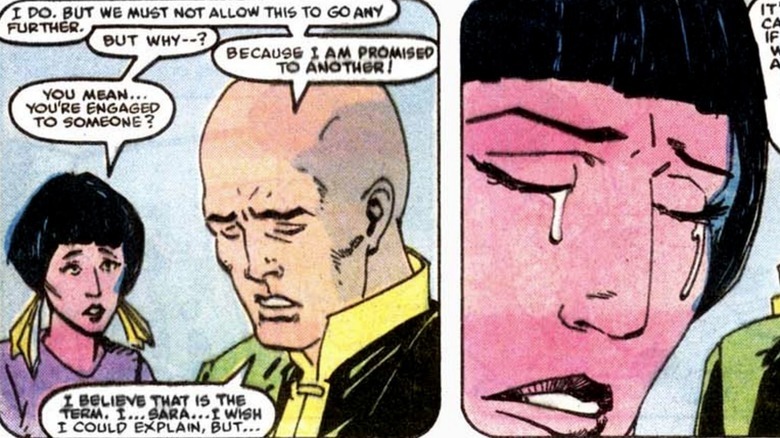 Wong's courage and acceptance in the face of seemingly-certain death, however, proved his fealty to Strange, his mission, and service to the greater good. Hopefully his remission sticks. There's no corner of the Marvel universe more, well, strange than the one Wong occupies. From the very beginning, he and the good Doctor have been facing down those bad guys who make the least sense, who threaten the mortal plane from the most angles, and present the problems that are most intractable. 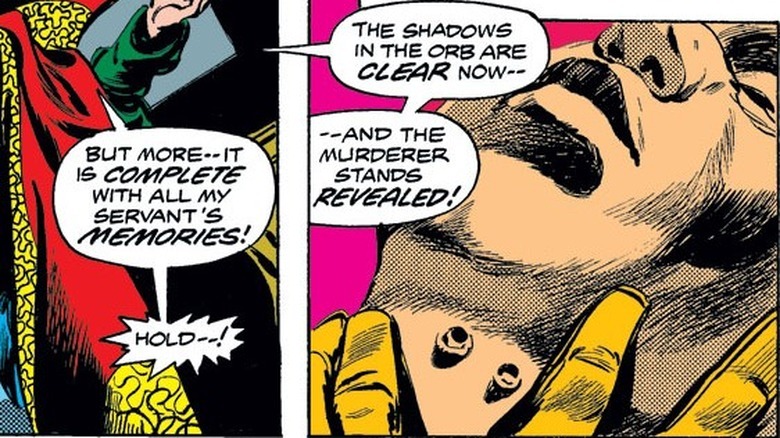 The best Doctor Strange creative teams lean into the mysticism of it all — to the point that Stan Lee admits, in Origins of Marvel Comics, that people assumed he was doing a lot more research on the magical mumbo-jumbo than he truly was — and send Wong and Strange on the oddest adventures. Theirs is the comic that doesn't have to play by the rules of superheroics, as magic makes its own. It's funny, then, that by and large, Wong is not a magic-user himself. This is, of course, very much not the case in the movies, where Wong wields sigils and scrolls with the best of them. But on the page, with the exception of a few alternate universe interpretations and special circumstances, Wong is merely a peak martial artist. He's comfortable with the spells and sayings of the world Strange occupies, but he does not use them himself. He stands in contrast to the magic around him, and as such, acts as a stable pillar in a shifting and mystical world. The 2000s have been a busy time for Wong. It was revealed recently that he maintains a secret sect of magical practitioners who exist entirely to absorb harm from unstable magic that would otherwise harm Doctor Strange. He regularly contends with the talking ghost of a basset hound. His master has been involved with everyone from the Avengers to literally satanic demons. Wong's life doesn't allow him a lot of leisure time. No era was more frantic, however, than the late '00s, when the position of Sorcerer Supreme went temporarily vacant. With Strange's sanctum in ruins and no one around to command the mystic energies of the world, Wong put himself out there as a candidate. It's an intriguing idea, what with the servant becoming the master and all, but Brother Voodoo ended up stealing his thunder, and Wong went off to work for the Avengers for a while. Maybe someday, Wong. 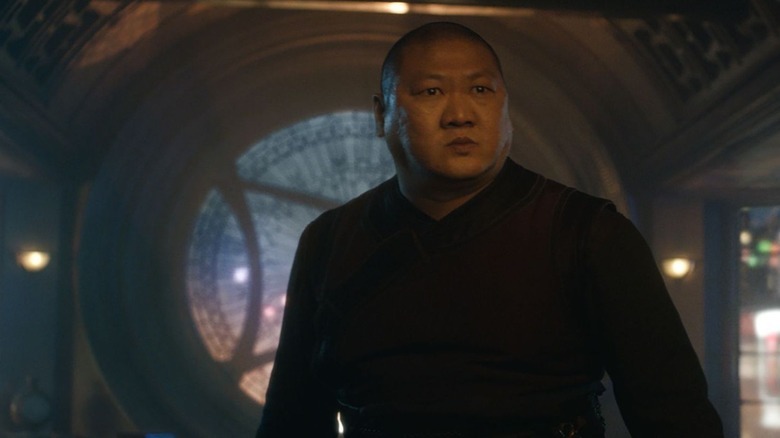 Benedict Wong's wry, Beyoncé-loving take on Doctor Strange's right hand man has come to define the character in the eyes of many, as is inevitable when it comes to the MCU. But Doctor Strange was not actually Wong's first on-screen appearance or even his first time being portrayed by a venerable actor. Wong appeared, alongside Strange, on the 1990s Spider-Man cartoon, where he was voiced by none other than iconic Star Trek actor George Takei. Wielding twin swords enhanced with mystical energy, Takei's low, intense murmur fits Wong perfectly. He and Strange are as simpatico as ever, but there's an edge to him here, even amidst the candy-colored chaos of the animated Spider-verse, led by Takei's performance. He's unknowable in the best way, a man whose depths you can perceive but not explore. 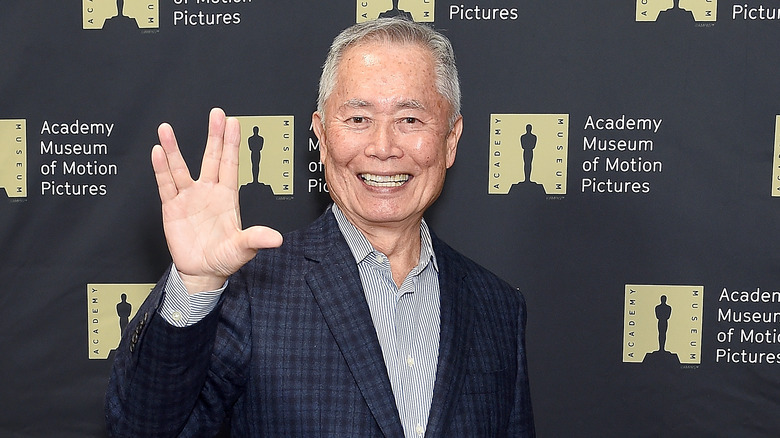 Hopefully we get to see Takei return to the role at some point, but if not, there are always reruns. Reimaginings are the bread and butter of superhero comics. Captain America was a wolf for a while, the Hulk is currently a body-horror commentary on the nature of evil, and Wonder Woman has been everything from an Emma-Peel-style spy to the literal goddess of truth. Despite this, Doctor Strange and Wong have been surprisingly absent from Marvel's many alternate takes. Generally speaking, across time and space, they are who they are: the master of the mystic arts and his faithful assistant. Except for the time that Wong was a doctor in his own right. 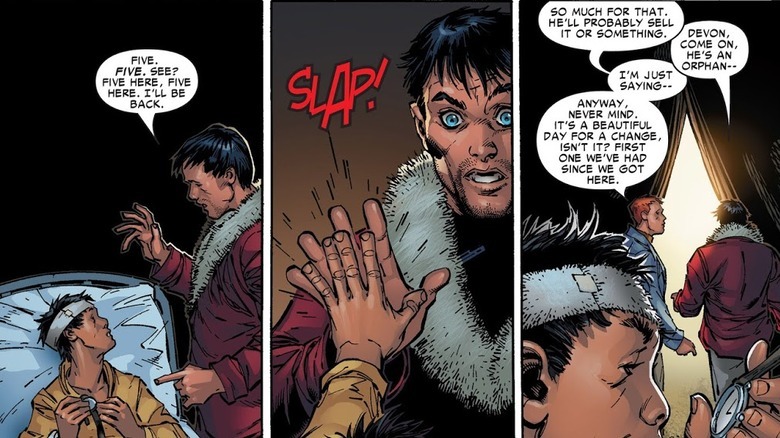 In the 2004 limited series Strange, Wong became a Tibetan orphan saved by Stephen Strange, then a young medical student, by total chance. Inspired by Strange's act of kindness, Wong goes on to become an American doctor operating under the name Stephen Wong. He becomes a warrior and a sorcerer in his own right but, ultimately, still manages to become Strange's servant — though the story treats this development as a complicated one. It's a powerful, boundary-breaking story that asks the question: who should be servants and who should be masters? It's up to the reader to decide.